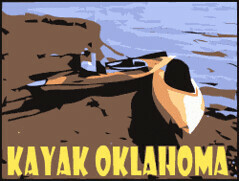 Kayak Oklahoma Logo, a photo by FreeWine on Flickr. Recent rains have raised the Washita River in Southern Oklahoma to paddling level. So, check your local river gauges for kayaking conditions. Other outdoor fun available to Okies this week include festivals & fun all over. The latest Oklahoma Paddle Sports Association newsletter is out. Get in on a Kayaking Roll class this Sunday! Two Oklahoma Wine Festivals will be held this weekend. Tres Suenos Vineyards & Winery in Luther, Oklahoma and Stone Bluff Cellars in Haskell, Oklahoma are both hosting events. There is also a festival being held in Slick, Oklahoma on Saturday. Nuyaka Creek Winery will be there pouring Oklahoma wine tastings. Maybe it is just my mid-life crisis talking here, but lately I feel like my toys are preserving my true wealth more effectively than my so-called investments. Example: we recently sold our old motor boat for nearly enough money to buy a cute little Miata ragtop. Once our Burgman scooter sells, we should own the little car free-and-clear. Meanwhile, my 401K plan sends out an annual report that begins with "abandon hope, ye who enter' and the so-called 'interest' my bank savings earn is anything BUT interesting! Many years ago, my wife and I decided to risk a bit of credit and buy some stuff to improve the quality of our lives. These toys encouraged us to get out and live life a little fuller and they even manage to hold some value. Sometimes the toys succeed and sometimes they fail. When the toys no longer inspire, I find I can often trade my old dream toy for someone else's toy...or the rent! I need to increase many things in my life. My faith, my friends and my forgiveness are areas more worthy of my efforts than simply pursuing higher net worth. That is why I plan to pursue more Pies and fewer Pie Charts. See you under the sun! Beautiful post and I also like festivals like food and wine. Thanks a lot. I like your blog. Thanks for sharing it. Thanks for your comment, June. I doubt that I can be much help finding a family for your exchange student, but I will ask a few folks and give them your number if they are interested. Many decades ago, my spouse and I made the decision to danger a bit of credit score and buy some things to enhance the excellent of our life. These toys and games motivated us to get out and exist a little bigger and they even handle to keep some value. Sometimes the toys and games be successful and sometimes they fall short. Agree! Kayaks do earn real money! because I dont have to put gas in it. Also every time I go I get a good workout.